For wholesale orders click here. Living More Closely With Spirit and Nature demands creative action while utilizing skillful means. Time has revealed the need for a comprehensive product which satisfactorily addresses all of our exposures to pathogenic vectors here on Earth Being Human. These include, primarily, stress, hunger, exhaustion, addiction, congestion, bloating, inflammation, pain, infection, oxidation, ionization, heavy metals, parasites, insomnia, sleep apnea, diabetes, hepatitis, anemia, candida yeast, fungal exposure, pneumonia, TB, Cancer, S.T.D. 's, Chronic Fatigue, etc., while completely nourishing and supporting elimination, rejuvenation, red blood cell development, new tissue growth, and boosting immune response. 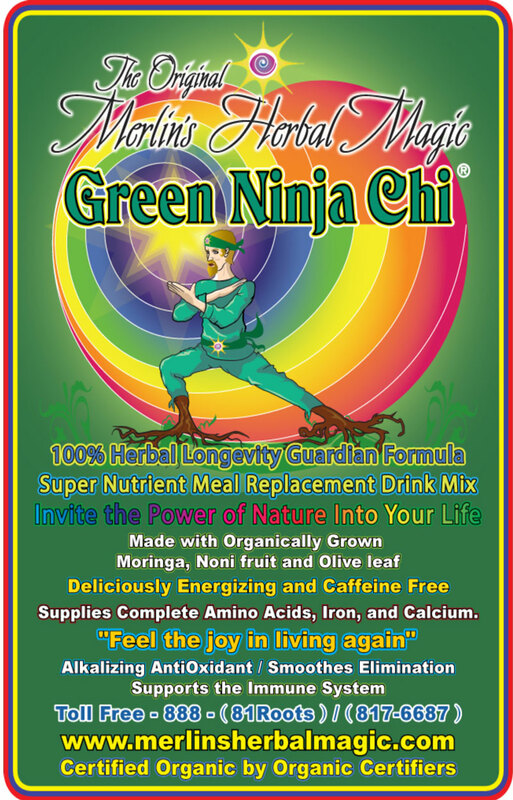 Ingredients: The following is a listing of the herbs contained in Green Ninja Herbal Guardian Formula, in order by weight and alphabet, with a brief synopsis of their Customary and Traditional Uses. Moringa leaf and fresh pods are from a powerful tropical/sub-tropical legume tree with many powerful nutritional and antibiotic properties. It contains all the essential amino acids in good balance with 10 extra aminos supporting, mineral calcium, iron, zinc, and with vitamins A, B6, and C. Moringa brings joy into longevity: It corrects malnutrition and scurvy; the delicious and continuously available seed pods kill worms, heals impotence, and infertility. Yummy leaf nearly doubles milk production and infant growth: It clears AIDS, S.T.D.s, Herpes, and is radio-protective; it is used as a poultice for wounds. This drought tolerant plant is always covered with leaves, flowers, and fruits, even at the end of the dry season, where it may be the only source of food. Prized in India, Asia, Africa, Central America, Polynesia and the Philippines. Olive Leaf Leaf from the plant form with the greatest individual longevity, each bush healthy for over 2,000 years. No pests or disease attack it because it will kill them. Parasite killer, calcium-rich nutritive tonic, antibiotic, antifungal, antiviral, broad scale immune support, clears exhaustion and Chronic Fatigue. Safe for children, supports healthy digestive flora. Pau D’Arco Inner bark of tree: a tonic and blood purifier, safe even for children; cellular energizer, brain oxygenator, for Parkinson’s, headaches; gum disease; counters anemia, building red blood cells; aids with nutrient uptake boosting digestion and assimilation; balances Autonomic Nervous System, aids sleep, bolsters immune, respiratory decongestant, anti-flu, antibiotic properties, fights invading viral and bacteriological vectors of all types, S.T.D.’s of all kinds, yeast infections, candida; assists the spleen, liver, kidneys, pancreas, may eliminate diabetes, helps blood disorders, rashes, fistulas, polyps, psoriasis, ringworm, scabies, pain relief, mineral and vitamin source. Supports healthy digestive flora. Nicknamed “miracle herb,” from South America. Cats Claw Inner bark of a climbing tropical vine. Adaptogenic, rejuvenative, counters stress, immune booster. Amazing nutritional profile, including rare alkaloids that are antibiotic, anti-viral, etc., plant sterols, polyphenols, proanthocyanidins, turpines, pantioxidants. Counters inflammation, calms arthritis, lupus, fibromyalgia, allergies, asthma, counters viral infections, herpes, candida yeast, chronic fatigue, STDs, cancers, cysts, and tumors. Opens circulation by clearing plaque in arteries and urinary tract, supports the heart, kidneys, bladder and prostate. Lessens and buffers pollution factors, including chemotherapy, chemical sensitivities, counters environmental toxins, poisoning, and rebuilds the liver from damage by hepatitis, cleanses intestines, reduces inflammation from colitis, diverticulitis, fistulas, polyps, ulcers, clears parasites while balancing intestinal flora. Supports emotional stability. Allspice Berries: Heating pungent adaptogenic five flavors, diuretic, antiseptic, nervine, stimulant, dissolves indurite and organic wastes, anesthetics, paint, plastics, etc. Urinary disinfectant, loaded with minerals and vitamins. Yummy cinnamon, clove and cardamon-like flavor. Coriander is a delicious, aromatic, carminative herb. It is rich in protein, fat, and minerals, which deeply soothes the nerves, helps remove toxic elements from the body. Ginger Root: Brings heat, aids digestion, doubles assimilation, improves vitality, relieves spasms, cramps and nausea, promotes menses, increases metabolism and appetite, good topically for poultice and sore muscles. Triphala Three different fruits, two bitter, one sour: Adaptogenic for air, fire, and water, Ayurvedic doshes, catalytic, regenerative, laxative, clears heat, plaque and pollution. 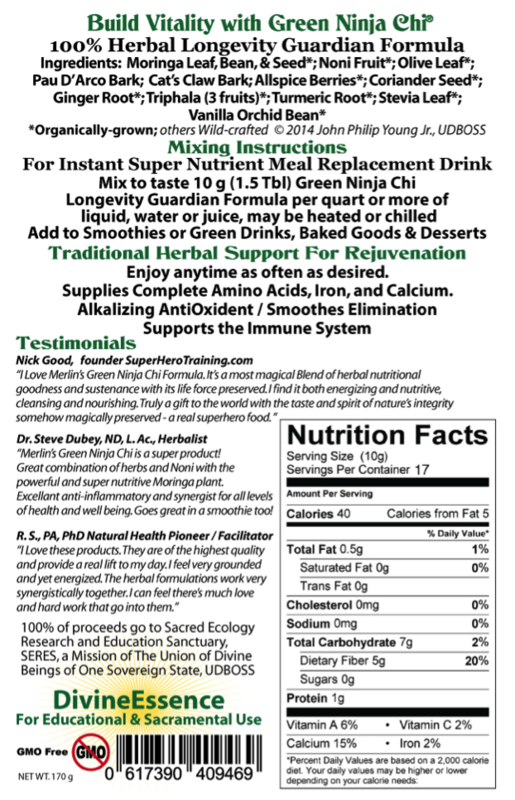 Feeds liver, adrenals, and bowel, regulates elimination, rejuvenates and revitalizes. Speeds repair of connective tissues with Vitamins A, E & C.
Turmeric Root: Bitter, antioxidant, stops bleeding, eases pain, inflammation, antibacterial, supports the liver, spurs bile, clears cholesterol, parasites, arthritis, and morning stiffness; good for poultice for all skin ailments, its elemental curcumin inhibits cancer. Stevia Leaf: Sweetener 300X sweeter than white sugar, body does not digest nor absorb carbohydrates from stevia. It kills bacteria in the mouth, intestines, kidneys, bladder, including gum disease, candida, cystitis, yeast and bladder infections, non-addicting, for diabetes, with Pau D’Arco. High in minerals, helps PMS, with magnesium, phosphorus, potassium, selenium, iron, silicon and zinc. 300X sugar overstimulates harmful bacteria, which kills them, while being safe for digestive flora. Vanilla Orchid Bean Pod of a climbing aromatic orchid vine. Aromatic, adaptagenic emotional balancer, second most popular flavoring after cherry. All herbs are certified organically grown, except for Pau D’Arco and Cats Claw, which are consciously wildcrafted. Moringa is organically certified in India, pending international certification. Wow, what a wonderful group of herbs to have around! Sincerely, Merlin, Chief Herbalist – The Union of Divine Beings of One Sovereign State U.D.B.O.S.S. Please consult with a licensed health care professional before consuming any new product or food/drink. Caution: Stimulating to hormones. Consult first with doctor if pregnant or on any drugs/treatment plan.